"Security & Compliance for Healthcare"
Security and Compliance has now become vital components for healthcare industry as it is in the midst of a perfect storm of change driven by healthcare security trends. To verify the deployment and ongoing maintenance of healthcare security and processes, security audits are mandatory for the healthcare industry. What can be done to keep a healthcare organization safe from security threats? 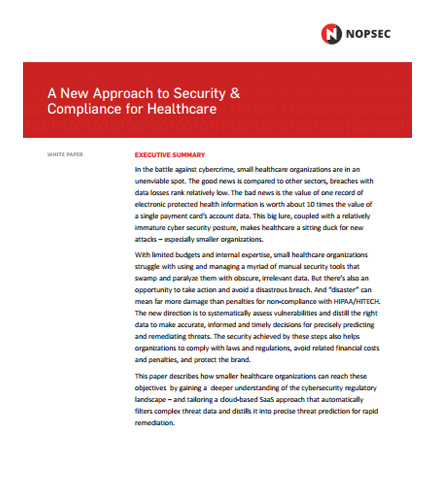 Read this whitepaper that describes how smaller healthcare organizations can reach the healthcare security and compliance objectives by gaining a deeper understanding of the cyber security regulatory landscape.